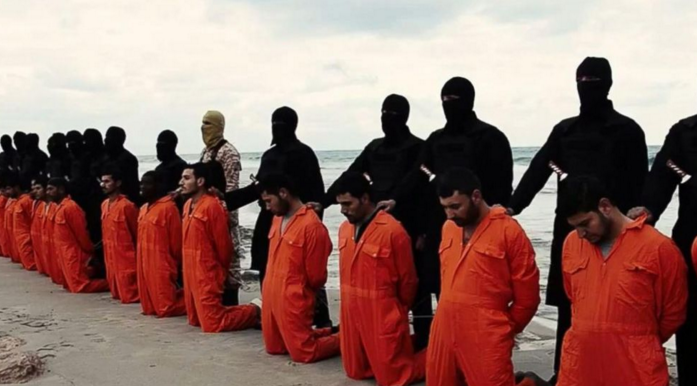 ISIS has a thing for killing and enslaving Christians. When Pamela Geller held her Draw Mohammed Art Exhibit in Garland, Texas and was attacked, it came as no surprise that the Jihadists were connected to ISIS. As Obama keeps the borders open and flies in hundreds of thousands of Syrian refugees the attacks on Christians will get more frequent and more deadly here in the United States. Garland was just the first. A lot more are coming. Pamela lives under the constant threat of death now. Obama is refusing to call the cleansing in the Middle East of Christians genocide. I wonder what he’ll call it here. Acceptable? ISIS is actively recruiting youth in northern Texas. I’m sure that’s not just for kicks. This is not going to end well. “We say to the defenders of the cross, the U.S., that future attacks are going to be harsher and worse…The Islamic State soldiers will inflict harm on you with the grace of Allah. The future is just around corner,” the terrorist group state on Al Bayan radio. The two men involved, one of which was Elton Simpson, converted to Islam in 2010. He had links to ISIS, and was taking order from a terrorist in Minnesota, named Mohamed Abdullahi Hassan. He was know for his attempts to recruit other Americans to the cause. More than a year ago, Shoebat.com warned that ISIS was planning revenge attacks in the United States, and particularly in Texas. And now it has been revealed that Simpson was investigated in 2006, and ultimately let go. What do you think? Is it time we started taking these attacks seriously? GOP Presidential front runner Donald Trump has pointed out that the threat that ISIS poses is in how they use the Internet “far better than we do.” Breitbart News reported that Trump said we have to not only be a force on the Internet, but take it over to beat ISIS. He told Breitbart Executive Chairman Stephen K. Bannon on Sirius XM’s Breitbart News Daily Radio program, “at some point they’re not going to go over to fight for ISIS over there, they’re going to stay right here and fight for ISIS.” And that is exactly right. You now have ISIS in all 50 states. The FBI has over 1,000 current investigations into ISIS related activity here in the US. The refugees that are coming in surely have ISIS militants in their midst. This is a ticking time bomb about to go off in multiple cities across the nation. The Dallas FBI Chief said that other cities face similar threats. “The threat’s not going to go away. It will morph into different areas I’m sure, but we’re in for the battle of a lifetime really.” It’s definitely the battle of our lifetime, no doubt about it.